13/06/2017 - The job market continues to improve in the OECD area, with the employment rate finally returning to pre-crisis levels. But people on low and middle incomes have seen their wages stagnate and the share of middle-skilled jobs has fallen, contributing to rising inequality and concerns that top earners are getting a disproportionate share of the gains from economic growth, according to a new OECD report. The OECD Employment Outlook 2017 finds that the employed share of the population aged 15 to 74 years rose for the third consecutive year. It is expected to reach 61.5% by the end of 2018, above its peak of 60.9% in the fourth quarter of 2007. 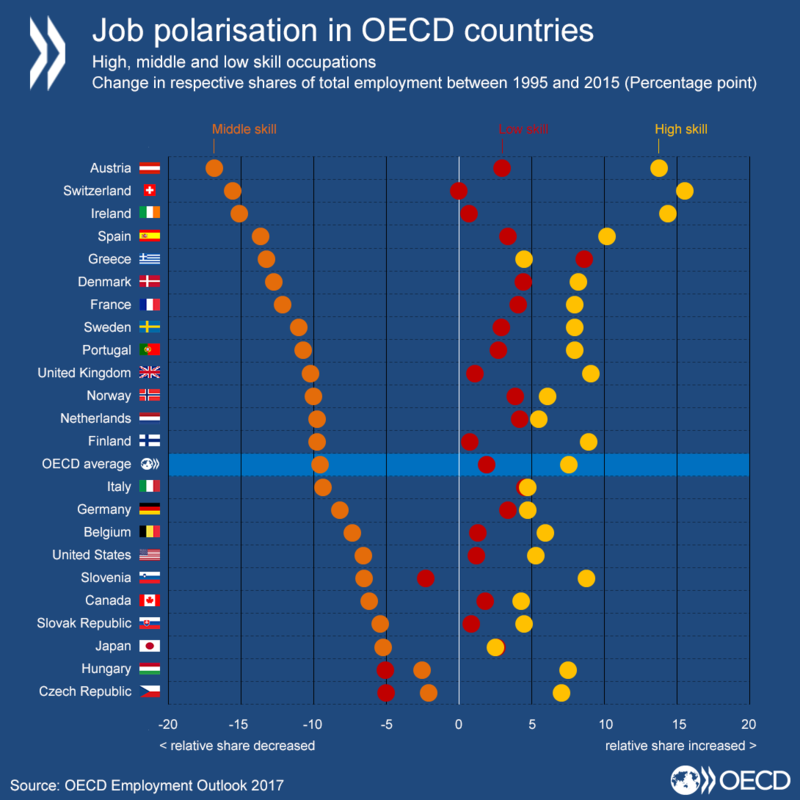 Growing occupational polarisation has also contributed to rising discontent with globalisation, as those with lower or declining wages feel that the benefits from openness and interconnection are being reaped by a few. But the Outlook reveals that more than trade integration, job polarisation has been driven by pervasive and skill-biased technological changes. Between 1995 and 2015, the middle-skill share of employment fell by 9.5 percentage points in the OECD area, while the shares of high- and low-skill occupations rose by 7.6 and 1.9 percentage points, respectively. The Outlook projects that the labour market will continue to improve until at least the end of 2018, with nearly 47 million more people employed than at the end of 2007. Unemployment in the OECD area has fallen by 12 million people since peaking in the first quarter of 2010 and youth unemployment is down by 3.8 million. The OECD average unemployment rate is projected to further inch downwards from 6.1% at the end of the first quarter of 2017 – 38 million unemployed – to 5.7% in at the end of 2018 – 36 million unemployed. But significant challenges persist. The labour market recovery remains highly uneven. The employment rate is likely to be only 1% above its pre-crisis level by the end of 2018. Large jobs deficits will persist in some countries, notably in Southern Europe. Even in countries where employment has recovered, wage growth remains subdued. About one-third of overall polarisation in the OECD labour market is due to shifts in jobs from manufacturing to services, with factory workers who have lost their jobs often being forced to take up lower-paid work in the services sector. The remaining two-thirds reflect rising polarisation within industries. These widespread shifts in employment are largely explained by the demand for labour concentrating in high-skilled jobs as well as low-skilled ones with a hollowing of the middle. To address this, governments must help workers build the right skills, and give them the opportunities to upskill and reskill throughout their working lives. Countries should also better assess changing skill needs, adapt curricula and guide students towards choices that open up labour market opportunities. In all OECD countries, high skilled workers have two to three times as many opportunities to participate in on-the-job training as their low-skilled counterparts. Social protection and labour market policies must also adapt to evolving forms of employment. More than one-half of independent workers in Europe are not covered by unemployment benefits. Providing social protection for all is key. Countries should take steps to ensure entitlements are portable from one job to the next, and make it easier to cumulate contributions from multiple jobs. The Outlook includes a new scoreboard comparing the labour market performance of countries based on the quantity and quality of employment, as well as the inclusiveness of the job market. It shows that only a few OECD countries do well in all three areas, including Nordic countries, Germany, the Netherlands and Switzerland.